Why Risk-Based Asset Management Plans? By Phil Barnes, WSB & Associates, Inc. The American Society of Civil Engineering has given US infrastructure a D or D+ grade over the last 15 years. Unfortunately, there is not an agency in the US that isn’t short of funds. Forecasting the future of our infrastructure performance has been done casually, which has impacted the true understanding of the level of risk that we are facing. Developing a business case for public funds can require that we embrace uncertainty about asset performance forecasts and communicate about it. Developing a better understanding of what we are forecasting to deteriorate can be valuable in defining whether resources for maintenance efforts are being effectively spent. Not only is it important that we focus our attention on deteriorating infrastructure, but the most important infrastructure that poses the most risk if or when performance fails. Managing public programs, including asset maintenance, rehab, and reconstruction activities can be extremely complex and fraught with uncertainty. For example, most public works director’s would need better data, research, and accounting information before they could decide, with certainty, that using salt for ice on bridges is better for structures than using automated anti-icing systems and chemicals over the long term. Politicians are faced with mounting financial needs and it is apparent that there is a need for more data driven understanding if they are going to be able to make the best decisions. Public works professionals regularly need to consider asset performance, budgets, laws, regulations, and other interests to provide guidance and direction to maximize efforts. While most professionals will say that they regularly identify and manage risk in day to day activities, few organizations have a comprehensive approach to risk management at the agency, asset class, or maintenance activity level. Many governments setup performance measures and develop asset management plans to optimize investments, yet do not plan for risks that can impact the achievement of asset performance. Professionals that work in pavement preservation appear to be leading risk-based asset management practices. The Minnesota Department of Transportation (MnDOT) focuses on collection and analysis of pavement condition data, and then use pavement deterioration models to identify risks to pavement performance. MnDOT’s risk processes, backed by data-driven pavement forecasts resulted in a budget shift and the creation of Minnesota's Better Roads Program. The Better Roads Program continues to address more than 700 miles of roads at a cost of $398 million. The simple business case that pavement professionals made was that our roads are a high risk in comparison to other types of assets and other types of budgetary needs. Considering the replacement of infrastructure in the state could be valued in the 100’s of billions, what the better roads program did was put a higher value on maintaining a current asset over building new ones that will need funds to maintain over time. This kind of asset management practice begs the question, should others develop data-driven risk forecasts for diverse asset types? For example, should we forecast conditions for drainage infrastructure, retaining walls, lighting, signs, or even intangible assets like mobility and travel time consistency? One struggle may be the accumulation of current performance data. Other challenges may include the development of forecasting models that accurately reflect deterioration rates and performance risk. Surprisingly, Australians might be the people to ask about global risk management practices. The country has a robust risk management framework that creates a minimum standard for risk processes for their entire national government. Australia sees forecasting risk as the tool that enables them to develop and deliver services, complete infrastructure projects, and optimize allocation of resources. Although Australia may be in the lead, most public works professionals would agree that the journey to develop risk-based asset plans for diverse types of assets could be worth the effort. As professionals we are driven to establish performance inventories, while also attempting to forecast future performance years from now. Why? 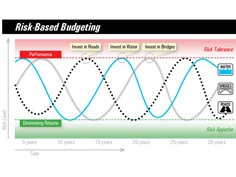 Because this type of forecasting process can help clarify future budget needs, and build a business case for funding infrastructure before it becomes the problem that it is today. Getting the right inventory data, including accounting and current performance. Forecasting expected future performance through more accurate deterioration rates and risk-based performance interruption expectations. Developing cost effective strategies that can mitigate risk and optimize maintenance spending over the asset’s lifecycle. Determining if there are other risk factors in play, such as major water systems that serve hospitals, or older utilities under a now high volume road. Evaluating these types of issues could drive not only the need to invest in our infrastructure, but where we invest. The goal of a risk-based asset management system is to manage future problems before they become expensive current problems with performance. This management process design can help minimize the need for unproductive efforts, and ensure productive asset management strategies for planned budgets. A risk-based asset management plan can make the complexity more transparent, while creating a business case for a reasonable maintenance practices and future infrastructure needs. Phil Barnes, Management Analysis and Development, WSB & Associates, Inc. Phone: (763) 270-3461. Email: PBarnes@wsbeng.com.